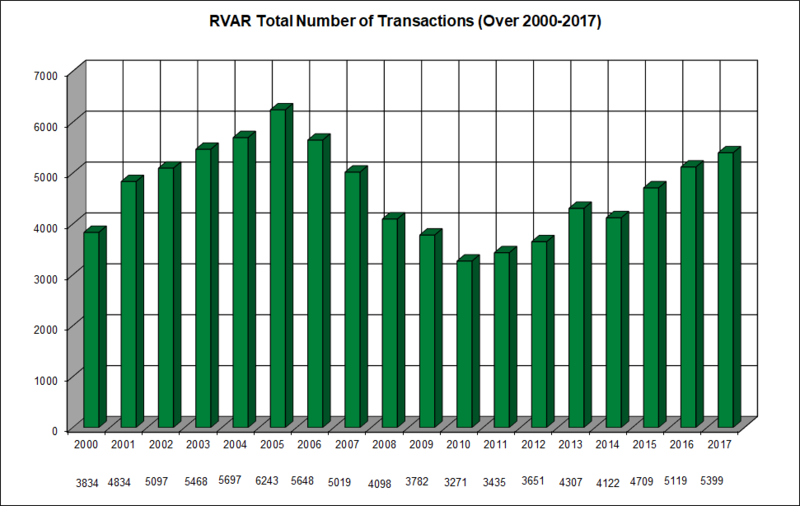 Here you’ll find in-depth analysis, but easy to digest graphs, of residential real estate sales for the Roanoke Valley of Virginia based on data from RVAR. 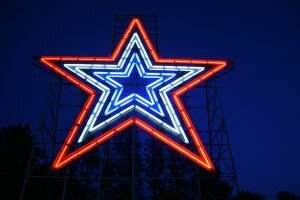 Be sure to see trends in mortgage interest rates at the end of this report as well. You are welcomed to share this with your friends. You can even share on Facebook or Twitter (just click share buttons at the bottom of the page, thanks in advance). 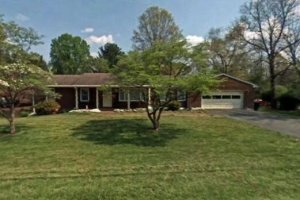 Sales of residential homes in the Roanoke Valley have been brisk so far in 2018 with a total of 4,228 homes sold (1.4% up from 4,186 at this point in 2017). Of those there were 1,535 homes sold in the third quarter (Q3). 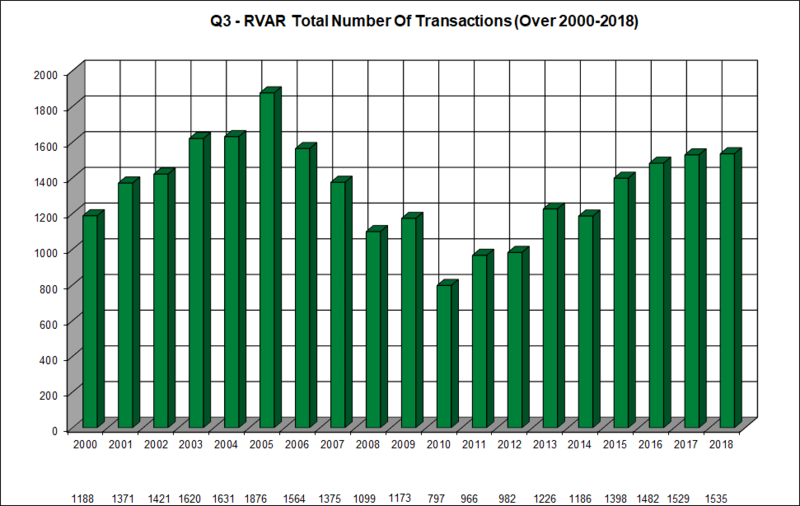 As you will see in the Total Number of Transactions graph (below) this is the highest number of home sold in Q3 since 2006! Additionally, homes are selling quickly! 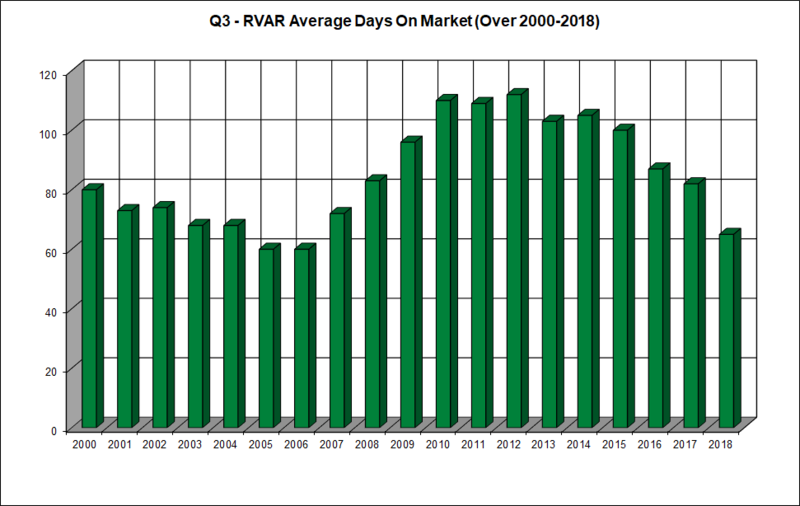 In Q3 of 2018 we are seeing the lowest number of days on market since 2006! In fact, these factors point to 2018 having the potential to be the best year since 2006. Here’s why…. even though we are having high volumes of sales, there is still a low inventory of homes for sale, meaning fewer homes to choose from. This scarcity of homes, coupled with a roaring economy and plenty of home buyers, drives up the speed of purchasing. 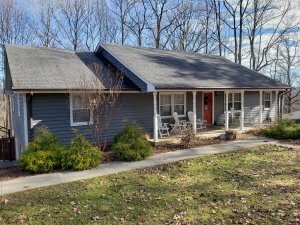 This phenomenon of quick buying ramps up the number of homes sold in short periods of time. There are two important indicators which point toward a scarcity of homes. Indicator #1: “Active In Range” (or AIR) means number homes that were on the market during that time period. The Q3 AIR has significantly decreased each year since 2010, and is at its lowest point right now since 2002. This is great news for home sellers, and means homes are selling quickly and inventory is low. Indicator #2: “Absorption Rate” which is the rate, expressed in months, at which the entire supply of homes will sell out. 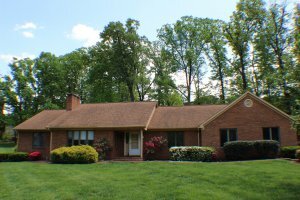 According to an article by NAR “six months’ supply is considered a balanced market.” The Q3 2018 Absorption Rate for the Roanoke Valley is 4.12 months. This means 2018 is, and will continue to be, an excellent year for home-sellers (click here to get a free Comparative Market Analysis on your home). But sellers will only do well if buyers have access to great loans, interest rates, and other capital. 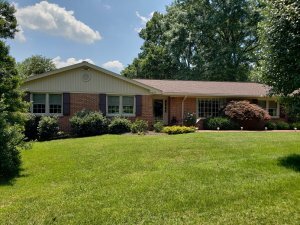 We still have historically low mortgage interest rates, and excellent loan programs available to home buyers (click here if you are considering buying a home). 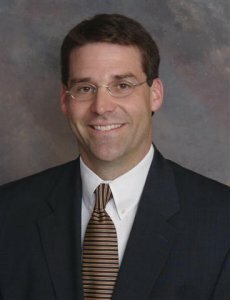 Take a look at current interest rates at the very end of this post. – Chart below illustrates Q3 home sales for each year from 2000 to 2018. 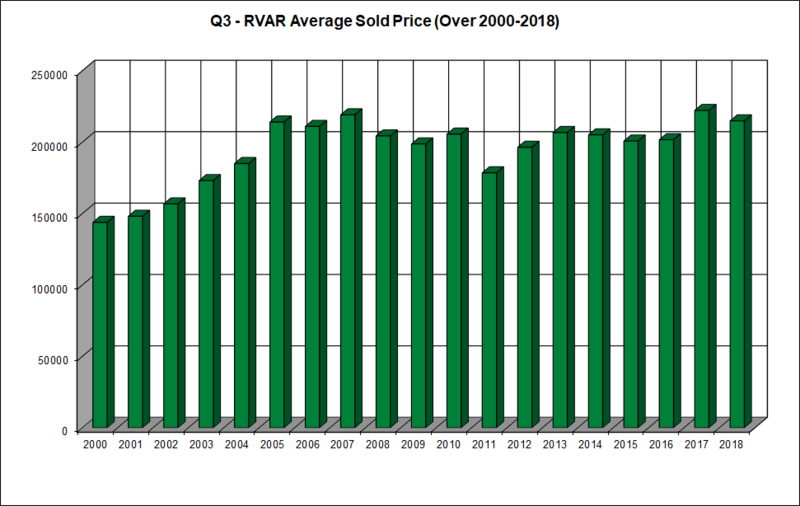 – Chart below illustrates Q3 average sales price for each year from 2000 to 2018. – Chart below illustrates Q3 average DOM for each year from 2000 to 2018. – Q3 2018 DOM (65) is lower by 20 days (23.5% down) from 19-yr Q3 avg (85) GOOD! – Q3 2018 DOM (65) is lower by 17 days (20.7% down) from Q3 2017 (82) ALSO GOOD! – Chart below illustrates annual home sales for each year from 2000 to 2017. – We’ll update this chart to 2018 numbers as soon as this year is over….